Ford began to analyze a wide array of data to determine whether a company’s strong performance on ESG issues led to increased share performance, increased profitability, lower costs and increased return on equity. 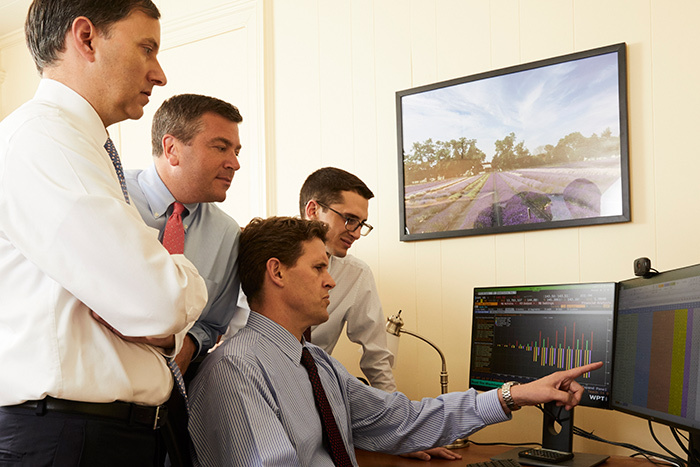 When he and Sturmak began to see evidence for a solid connection, they thought that with some deeper number crunching they could develop a powerful tool—a proprietary model to assess investment opportunities from an ESG perspective. For that, they turned to another Dickinsonian, Professor of International Business & Management Steve Erfle, who is now a partner with BlueSky. Armed with Erfle’s model, which used hard data to make a business case for sustainability, Sturmak and his team penned a white paper, ESG and the Future of Investing, which made a compelling case for the firm’s vision. The research determined that though 85 percent of ESG data doesn’t add value to the investment process, the remaining 15 percent can add value and enhance returns. The key to the research was identifying the specific ESG factors that can add value, which vary from one industry and region to the next. The white paper was key in recruiting seasoned portfolio managers Ron Dornau and Chris Matyszewski, who brought a combined 45 years of experience in fundamental value investing to Sturmak’s growing team. BlueSky publicly launched in October 2016, and following a successful first year, added Grant Cleghorn as partner and head of global marketing in November 2017. The firm is now a signatory of Principles for Responsible Investment, the world’s leading proponent of responsible investment strategies, and recently was featured as a case study in the Sustainability Accounting Standards Board’s (SASB) ESG Integration Insights, which promotes making sustainability concerns a core part of financial accounting. “Historically, the idea of socially responsible investing repelled mainstream investors,” says Sturmak. “That’s because it was initially based on divestment. It was defined by what you’re not going to invest in, and that means you’re just shrinking the available investment universe—which means shrinking your opportunities to make money.” BlueSky, on the other hand, studies how factors like greenhouse-gas emissions, water usage, employee satisfaction, workplace diversity and corporate governance have historically had a positive effect on business performance. Then, instead of telling clients where not to put their money, BlueSky identifies attractively priced companies with solid fundamentals that are also sector leaders on financially material ESG factors. And as Sturmak continues to harness finance for the greater good through BlueSky, he intends to keep turning to Dickinsonians for help. He’s already brought fellow former history major Anastasia Pfarr Khoo ’97, CMO at Conservation International, on to BlueSky’s advisory board. The firm also has taken on several students as interns, and Sturmak plans to use more in the future because he believes the college’s mission-driven, liberal-arts approach is exactly what’s needed for this kind of work.